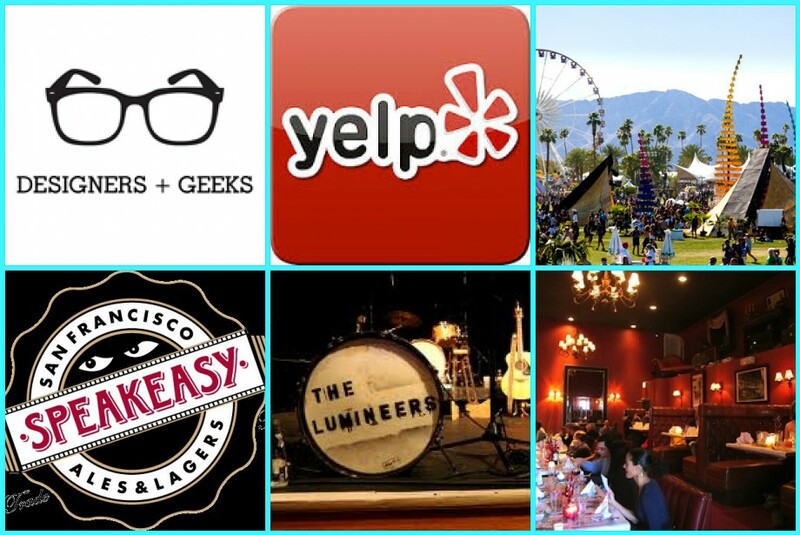 This week, ABCey has a great mix of things for you to do! Of course we’re encouraging you to get outside and do something active in the sun, but many of our picks for this weekend just happen to be inside. From epic concerts to tech seminars to good ol’ beer and soul food, you’re bound to find something to meet your preference in this Weekend Lineup. 1. Designers + Geeks: The Future of Infographics | April 18 | Mission Street | Infographics are timeless, but practitioners must evolve to remain effective and combat the oversaturated media landscape. This presentation will examine the continued innovation in the field, identifying applications in which information visualization can create the appeal and soundness necessary to deliver a powerful message. 2. In Concert: The Lumineers | April 19 | Greek Theater, Berkeley | The Lumineers are an American folk rock band based in Denver, Colorado. Having grown in popularity at an insane rate in the past year, the band is here in the Bay Area to put on a show that will leave any attendee beaming with happiness. Their upbeat folk sound and care-free demeanor is absolutely contagious, and there’s no better place to see them than the Greek Theater! 3. Yelp! Seminar and Networking Event | April 20 | Sacramento | Do you know how often your prospects are seeing negative or positive reviews of your business? According to a recent study by two Berkeley economists, a half star improvement in your Yelp rating can bring you 30-49% increase in business! For business owners, entrepreneurs, on-line marketers, social media enthusiasts, and those who are looking to network with other professionals. 4. Bootie SF: Coachella Mash-Up | April 20 | DNA Lounge | So Coachella sold out before you could get tickets to the big festival? Then come out for the next best thing: Bootchella! Resident DJs Mykill, Entyme, and Dada — along with Bootie’s very own live mashup rock band, Smash-Up Derby — will be playing music from Coachella artists past and present all night! But there’s one big twist — they’ll all be mashed up! Sure, it might not be the “real” Coachella … but it’s 3000% cheaper, and you won’t get sunburned! 5. Speakeasy Beer & Soul Food Dinner | April 21 | Old Skool Cafe | Both Speakeasy and Old Skool Cafe are nestled in the Southeast corner of San Francisco, where they enjoy mostly sunny days, and clear skies. It’s a natural fit to have the food and beer paired with one another! Start cocktail hour with Sriracha deviled eggs, and stick around for dinner that includes babyback ribs in Prohibition BBQ sauce. Planning to attend any of these events? Talk to us in the comments below or on Facebook & Twitter!